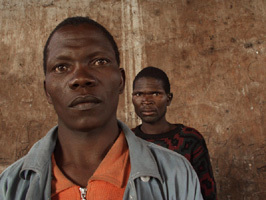 Taken in February 2002 in the Angolan province of Bie, near Kuito, Guy Tillim's Kunhinga portraits portray displaced people, who in the months before the end of the civil war, fled in advance of the Angolan government's "clearing" of regions where civilians had provided cover for UNITA soldiers. 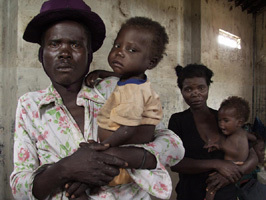 The subjects had walked for five days from Monge to seek refuge in the small town of Kunhinga in the safe havens provided by foreign agencies stationed in the area. These colour portraits are a new departure for Tillim who is best known for his black-and-white reportage. The images are available in an edition of 12 pigment prints on 300g cotton paper, archivially printed by Tony Meintjes, signed and inscribed by the photographer. Paper size: 60 x 76cm, image size: 49.5 x 66cm. Please contact us as regards the current availability and price for each print.